Expect to re-steep this leaf 3-4 additional times. Mao cha can be stored and aged after it is made, or it can be a new blend that is comprised of aged mao cha from different years. It is found in a variety of leaf sizes, too, depending on the location of the tea trees and the type of local cultivars (size of the leaf) the mao cha was made from. Mao cha is a great example of the effects of terroir. As you can see, the possibilities and resulting flavors of mao cha are almost endless. All of these variables result in a staggering choice of available mao cha from the various tea villages for Pu-erh producers to work with. 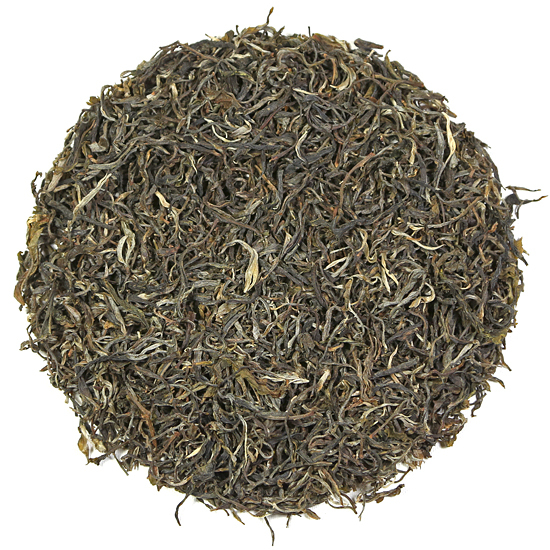 This slightly earthy sheng Pu-erh has a fresh forest aroma and a pleasant taste. It is a great introduction to this category of tea. We have recently purchased an assortment of loose-leaf sheng Pu-er from various production areas because we think that these teas should become more well known and available to tea enthusiasts. Sheng Pu-erh offers the opportunity to really taste the essence of the tea trees and the place (terroir) without processing technique getting in the way and adding to the taste of the leaf. Sheng Pu-erh is essentially the same as mao cha, the raw material used to press sheng Pu-erh cakes. Sheng Pu-erh has many tastes derived from the location of the tea forest (terroir), the age of the tea trees, etc. 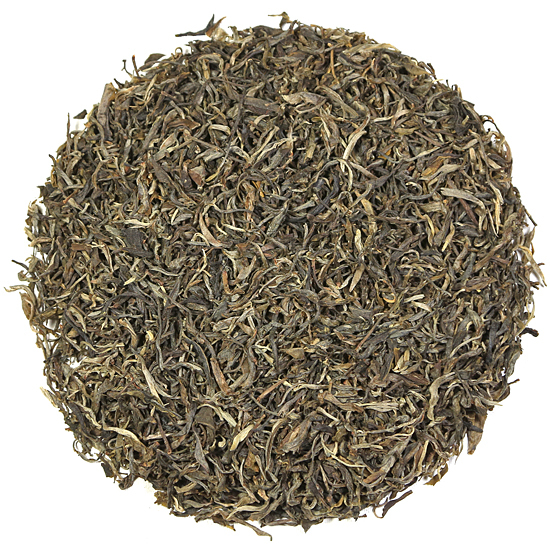 Essentially loose-leaf sheng Pu-erh has a sweet, woodsy; forest flavor and mild aroma. It is perfectly lovely to drink this tea now; or you can put some aside to age and strengthen over time. The Naka tea harvesting area is located near the Mengsong/Nannuo tea harvesting areas. This area is populated by Hani people who own a dense concentration of ancient tea trees. They take their tea and the presence of their tea trees very seriously and view the tea trees as a connection to their ancestors. We found this tea to have a straightforward, clean, woodsy aroma and an attractive pale-gold colored liquor in the cup. Be careful when steeping this leaf, as over-steeping it can turn this tea into a pithy and bitter beverage. Naka is a Lahu minority village located at the northern end of Mengsong area, between Menghai and Jinghong. It is a remote area close to the highest peak in Xishuangbanna. The ancient tea trees in this area grow at elevations as high at 5,900 – 6,500 feet . The environment is colder here than in other tea-growing areas of Xishuangbanna, which results in tea trees with slightly smaller leaves and unique aromas. Sheng Pu-erh is un-fermented when young but microbial activity on the leaf will allow the tea to slowly ferment over time when the tea is kept under good storage conditions. Sheng Pu-erh can be drunk now or stored for years to allow a slow microbial transformation of the tea into something rich and full. Similar to young wines that will, over time, transform into much more substantial wines, Sheng Pu-erh is prized by collectors and tea enthusiasts for this ability to age and improve over time.